There are many reasons to come to Central. From some of the country's best fishing to its top vineyards, the thrill of mountain biking through remote tussock to the leisurely pleasure of a stroll through wild mountain flowers. Arts, crafts, fine regional food. 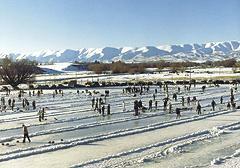 Jet boating, gold panning, ice skating outdoors on a clear winter's day. The satisfaction of a relaxed round of golf amidst some of the best scenery you can get. These are just a few of Central Otago's experiences. Most visitors who come here never want to leave. But they take home treasured memories, and nearly always return. 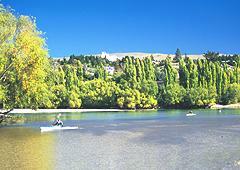 So discover this special place for yourself, and take away a piece of Central Otago in your heart. For a perfectly preserved pioneer town of the 1860's, head upriver to Clyde. Here buildings of stone, timber and cob are unchanged reminders of a golden heritage that's still reflected in the relaxed pace of life. Take the time to meander and the charm of Clyde will work its magic. Choose from visiting the unique local museums or gardens, depending on your interest for history or horticulture. Make the most of the many opportunities for water sports and recreation afforded by nearby Lake Dunstan. Linger over local cuisine at the fine restaurants and cafes housed in buildings over 100 years old. Then, wherever you choose to lay your head at night - luxury lodge, motel, homestay or holiday park - your dreams are sure to be sweet. 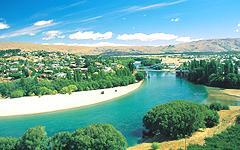 Roxburgh, situated in the heart of the Teviot Valley, is the gateway to Central Otago and all its wonders. An integral pathway leading to many natural outdoor locations inclusive of walking, hiking, biking, fishing and camping activities for all ages. The town of Roxburgh is nestled up against of the mighty Clutha River that boasts some of the best salmon fishing in New Zealand. Surrounding lakes are well stocked with both Brown and Rainbow trout. The Clutha River moulds its way boldly through the Teviot Valley as it nurtures the largest water volume of any river in New Zealand. The east bank of the river signposted at Beaumont as the Millennium Track, was the route used by Maori parties as they hunted moa (large flightless birds, now extinct) and as they headed to the West Coast in search of the precious pounamu (New Zealand Greenstone). Early travellers referred to it, as "Maori Track". Roxburgh is located centrally to Invercargill and Dunedin from the south and east and Queenstown and Wanaka from the north and west. History, along with seasonal colour abounds throughout the Teviot Valley. Stretching from Beaumont to Shingle Creek, linking the rolling hills and dales of the Pomohakas to Lake Onslow and beyond, the Teviot Valley offers the traveller many diverse and interesting excursions that make up this unique district. This is border country. The buildings, street names and bridges of Roxburgh such as Ettrick and Millers Flat, take their names from the Scottish Borders. The area is thoroughly indulged by the weather which has created a dry microclimate that most can only dream of. The warm summers to the wintry snow climate is enhanced by the continually changeable photographic landscapes. Horticulture, agriculture and small developments of viticulture are centrefold within the regions geographical structure. Gold was originally discovered in 1862 in the Teviot River, a tributary of the Clutha. By the 1880's many large Gold-dredgings were in progress on the magnificent Clutha River, their lasting reminder that is now part of the present tourism industry in the Teviot Valley. A reality for the traveller to experience is the Horseshoe Bend Bridge, one of the few remaining suspension bridges built between 1842 & 1890. This shows the importance of safe river crossings to our early settlers. Alongside the present Roxburgh bridge can be seen the remains of two others. At its peak, the area saw many miners supported by storekeepers and six hotels. Some of these historical buildings are still in use today. The miners were involved with 18-20 dredges between Island Block and Coal Creek-close to the present Hydro Dam (Roxburgh Dam that was completed in 1956). 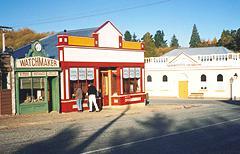 Roxburgh is the service centre for this gold initiated settlement dating back to the 1860's. The beautiful old buildings and the historic sites are testament to the skills of the early European and Chinese settles, the first gold miners, orchardists and farmers. A number of stone and mud brick buildings are still in use today including the superb little museum dedicated to local history. In a journey of just over 1 hour, the traveller will experience the transition from the plains of Southland to the dry core of Central Otago. A stop off to enjoy part of Central Otago Art and Craft, Ale and Wine Trails that wend their way the length of the Teviot Valley taking in historic landmarks can be experienced. Ask for a map from the Roxburgh Visitor & Information centre as a reliable guide. Take to the hills on a full or half-day walkway choosing your own mode of transport from 4WD to mountain bike. For the individual family or groups, public access is available to areas at heights offering panoramic views of the valley, Roxburgh township, the Clutha River, the Hydro Dam, Lake Roxburgh and the Horticulture "tapestry" of Roxburgh. Experience the beautiful walkways including the Bullock track, Town River Walkway, Grover's Hill and the Lonely Graves/Horseshoe Bend Walkway leading to the Millennium track exiting at Beaumont Bridge. Allow time to pick and sample the fruit, some of which are descendants of trees planted dating back to 1866. Apples, peaches, plums, nectarines, pears, cherries and berry fruit are seasonally harvested throughout the valley then distributed throughout the country as well as exported around the world. Visitors have access to many of the local gardens open to the public, orchard tour, farm tours, and visit the southern most vineyard for wine tasting-purchase fresh fruit from the orchards numerous fruit stalls. A warm cosy meal or snack can be attained from the number of cuisine outlets scattered throughout the area. For a restful night, a selection of diverse accommodation is available in the form of Bed & Breakfasts, Motor Camps, Hotels, Motels, Lodge, BBH, Backpackers, Farm and Home stays. To cater for all agendas, taking part or interests, there is the choice of the Art Gallery, Museum, Parks, and Entertainment centre/Movies, Annual Rodeo, 4WD Safari. Horse trekking, Bowling, 18 hole golf course, Trots and the Roxburgh annual Triathlon/Duathlon. Lake Roxburgh is the ideal location for water sports - kayaking, jet boating, water skiing and sailing. The town facilities include medical, educational and recreational opportunities. Times shown are an indication of driving time without stops. Please allow additional time to enjoy the various sightseeing opportunities available in the Roxburgh Teviot Valley District. If nature were a painter, then these would be the inspiration for some of her finest works. 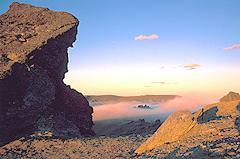 And it's here, on this moody, dramatic landscape, that some of Central's best-kept secrets are waiting to be discovered. From the picturesque appeal of Ophir, St Bathans and Naseby to the sheer magnificence of the Ida Valley, nature's palette takes your breath away. The Maniototo formed part of the Dunstan trail, the route from coast to hinterland used by Otago's early pioneers and gold prospectors. Today the remnants of this busy past - mud brick cottages, original pubs - can still be visited in places like Patearoa, Paerau and Oturehua. But history is also preserved in the villages of Ophir, Naseby and St Bathans, satellite townships, born of gold. Recreational opportunities abound in Naseby, where mountain biking, golfing, curling, ice skating, swimming and walking are just some of the options. The main street of St Bathans remains much as it did more than a century ago, but pays tribute to its heritage in a truly spectacular way with the famous Blue Lake, formed by mining sluices, where windsurfing and waterskiing can by enjoyed in summer. Stroll down Ophir's once busy main street and imagine the bustle of this once busy township. Many of the unusual names abound across the region, such as Eweburn, Swineburn, Gimmerburn, Houndburn, Pigburn and Hoggetburn were given for creeks and streams by John Turnbull Thomson, Chief Surveyor of Otago, while surveying in 1856. 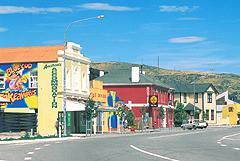 Maniototo's attractions - including some of Central's prime fishing locations - are all within an easy drive of Ranfurly, a rural art deco township which today provides a handy focal point for services and supplies to the rural community. 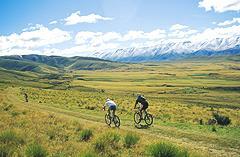 Also refer the Otago Central Rail Trail. Fortune shines on Cromwell and the nearby settlement of Bannockburn. Once these centres were the focus of a thriving goldmining trade. Today they still draw people from far and wide, thanks to the other, equally precious resources with which they have been endowed. Summer fruits such as apricots, nectarines and cherries, ripened to perfection in the area's Mediterranean climate, is a large part of this new 'gold'. Equally celebrated is the local wine, the product of Bannockburn's sun-bathed rocky slopes, which somehow captures in a bottle the warm flavours and enduring spirit of this distinctive corner of Otago. 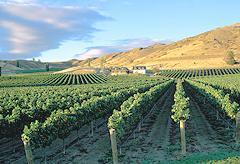 The Central Otago region is now New Zealand's fasted growing wine producing region. 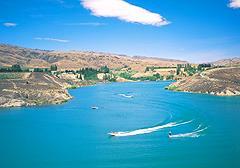 Cromwell, on the shores of Lake Dunstan, is the ideal base for exploration and adventure. Take your pick from fishing, boating, water skiing or, in winter, any one of the many ski fields which are in handy proximity. Ramble among the town's historic precinct, where local arts and crafts can be enjoyed. Try your luck at gold panning, or venture into the scarred landscape around Bannockburn, where tailings and tumbledown cottages are a fascinating monument to the former golden era. Discover the history of the goldfields by exploring the mining village at the entrance to the Kawara Gorge. Here, as in the rest of Central, the land is rich in character. To fully appreciate its grandeur, spend some time walking in the dry schist ranges or head up to Bendigo, an old gold town where time seems almost to have stopped. Here the bones of buildings represent what was once New Zealand's frontier, but you can feel Central's spirit of adventure still very much among the hills. For further information on: Fishing competitions, sheep dog trials, golf tournaments and other sporting events, contact the local Visitor Information Centres. 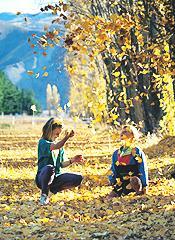 Explore the Goldfields Historic Park and pan for gold in Cromwell, walk the Bendigo goldmining area, visit the Bannockburn wineries and discover the unique geography of the area. Sail or fish Lake Dunstan, visit the wetlands at the head of the lake to view the birdlife, explore the arts and crafts in Old Cromwell, a faithful re-creation of the old business district submerged under Lake Dunstan. Take part in an orchard tour and pick your own apples, apricots or cherries. Drive the scenic 20 km of highway between Cromwell and Clyde and picnic at one of the many beaches along the shores of Lake Dunstan. 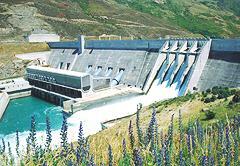 Explore Clyde, home to New Zealand's largest hydro dam and once the original centre of the Otago Goldfields, spend the day discovering the unique history of the area in the town's museum, enjoy a relaxing meal in one of Clyde's restaurants, famous for their international and regional cuisine and spend the night in either a luxury hotel, motel or holiday park. Golf, horse trekking, mountain biking, fishing, boating and wild flower walks all tempt the visitor. 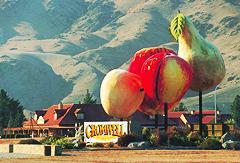 Alexandra, the largest town in Central Otago, home to the famous Blossom Festival is a great place to stay and explore the area. A leisurely walk along the banks of the Clutha through the tailings left behind by the gold dredges of last century, a spot of shopping in the town centre or a brisk climb to the base of Alexandra's clock on the hill to view the valley in all its seasonal glories. Visit the vineyards in the area and taste award-winning wines. From Alexandra begin your tour of the Goldfields Heritage Trail, deep into the heart of the Maniototo. Visit St Bathans, home of the Vulcan Hotel, trapped in time, this example of our early history offers hospitality today as it has for over 100 years. The Maniototo offers much for the visitor with farm stays, small game hunting wonderful fishing or mountain biking in the Naseby Forest. Walk or ride the Otago Central Rail Trail and follow the footsteps of our goldmining forebears through Danseys Pass and Naseby as you explore the area. 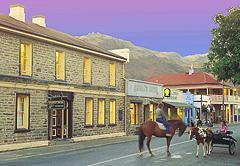 Visit the Ranfurly Display Centre in the Maniototo's main town. Then follow SH85 and turn off down the Ida Valley in winter home to the unique sport of Curling. First stop on this Heritage Trail is the Golden Progress Mine and in the village of Oturehua, Gilchrists Store is a faithfully preserved old style country grocers. A visit to Hayes Engineering Works, little changed since its establishment in 1895, is viewed today as it appeared when in full production. Continue your journey through the Maniototo and visit Ophir. Cross the glorious Daniel O'Connell Bridge over the Manuherikia River, renowned for its trout and travel through an area that has inspired painters and artists. This journey takes you back through Alexandra on towards Roxburgh and the Teviot Valley. A stop at Fruitlands and Mitchell's Cottage gives you an opportunity to experience the uniqueness of this area. The valley's orchards line the road as far as Millers Flat and Ettrick. After a walk along the banks of the mighty Clutha River, a visit to the craft galleries, or fishing for salmon from the dam wall, complete your day by sampling the golden cider created in the valley.